K-Oxyma is a potassium salt of OxymaPure and eventually proved to be with impressive and outstanding benefits. It was found out that the complete suppression of the acidity of OxymaPure, converts K-Oxyma into the most suitable coupling choice when peptides are assembled in highly acid-labile solid-supports, avoiding premature release of the peptide from the resin. K-Oxyma is distributed exclusively in north America market by Gyros Protein Technologies (for quantities below 35 kg per order). K-Oxyma Enhanced solubility in organic solvents, which is of great importance in the preparation of coupling mixtures. K-Oxyma gives results comparable to HOAt in step-wise solid phase synthesis without change of protocols. K-Oxyma demonstrates less epimerization than HOBt in fragment condensation reactions in carbodiimide mediated peptide coupling. K-Oxyma shows promising results as suppressing agent of base-mediated side reactions in peptides synthesis in strictly demanding peptide bond formation. 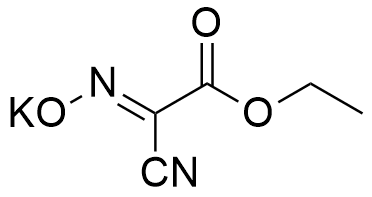 K-Oxyma is non-explosive and non-allergenic in comparison to HOAt, HOBt and related derivatives. K-Oxyma shows higher thermal stability and a lower pressure release than parent benzotriazoles HOBt and HOAt. Following the research of prof. A. El-Faham and F. Albericio, it was found out that combinations of EDC·HCl and potassium salts of oximes are new and unique coupling cocktails that could be used in particular for the formation of hindered peptides such as Aib-enkephaline pentapeptide. P. Cherkupally, G. A. Acosta, L. Nieto-Rodriguez, J. Spengler, H. Rodriguez, S. N. Khattab, A. El-Faham, M. Shamis, Y.Luxembourg, R.Prohens, R. Subiros-Funosas, and F. Albericio Eur. J. Org. Chem., 2013: 6372–6378. Y. E. Jad, S. N. Khattab, B. G. de la Torre, T. Govender, H. G. Kruger, A. El-Faham and F. Albericio, Eur. J. Org. Chem. 2015, 3116–3120.